Animal pencil drawings offer so much variety so where do we start? Well, beginner artists need to start with pictures to reference because animals do not sit still long enough for us to draw them from real life successfully. If you are desperate to know how to draw, I always recommend you start off by copying simple outlines that appeal to you. I chose to draw Australian animals because I feel drawn to that topic (maybe because I'm an Aussie!) and straight away that makes my task so much easier. Let's start with an outline of a lizard that looks very much like a gecko. I have drawn all of these cuties in their simplest form. I feel like each one is a triumph because I succeeded in removing all fussy detail and that indicates to me that I am progressing. If this subject looks achievable to you, please get your pencil and paper ready and join me by copying some easy animal drawings. It doesn't matter if you don't like your initial efforts, you have to be realistic and give yourself some time to improve. Each effort produces a result and each result takes you one step closer to your ultimate goal. With a good variety of animals at your disposal here, you get the chance to study each one and become familiar with the differences and proportions. As you look at your reference picture, sometimes it helps to break the form into shapes on your paper. You can then build around the shapes, using them as your guide. To tidy up the resulting image, just erase the unwanted lines before you declare it is done. I'll keep with the theme so far and show you another member of the lizard family. This goanna outline is so simple! I started at the tail but that's because I have a tendency to draw from left to right which saves me from smudging the work in progress. You can use your pencil to measure and pinpoint how long the goanna is and how thick his body is. Make little dots or marks on your paper and then draw around these helpful guides. Read more information about the measuring process which helps trainee artists produce good outlines. 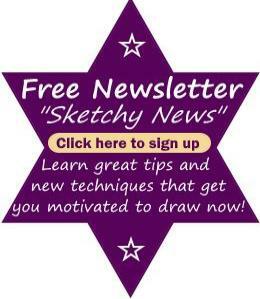 Using helpful methods to learn to draw is similar to having training wheels on a bicycle. At first, children rely heavily on those training wheels to keep them upright but pretty soon they don't need any help at all. It is definitely ok if you want to depend on training wheels at the start of your drawing adventure! A frill-necked lizard is also called a Frilled Dragon. If I had to rate the degree of difficulty, I can safely say that this one was not all that easy. I feel as though it is out of proportion but I thought I'd show it to you to illustrate failures are a fact of life. If you weren't here, I would hide this one! At this early stage of my so-called experience, I carefully selected pictures of animals that were almost front-on because I knew next to nothing about perspective and I tried my best to avoid it. At the time, I thought the frilly lizard looked like something I could draw easily but I was mistaken. Not to be deterred, I simply take this as an indicator of what I need to focus on to improve my skills from this point on. This little fellow is a koala bear. I grew up in a country town and koalas were a common sight in the gum trees. We never got tired of admiring them. Now, with growth and expansion happening even in country towns, they are not so easy to find and that is pretty sad. 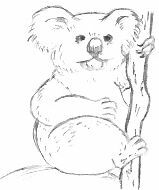 I know I am going to create more koala drawings in the future because they are appealing and cute. I find I don't really see glaring mistakes until I look at my completed animal pencil drawings the next day when I generally spot a flaw that wasn't evident at the time. This is an amazing exercise, I can scrutinize my artwork and for the life of me, I can't see anything amiss. Next day, with a new perspective, huh, flaws are spotted no trouble at all. You may have this experience too, so don't take it as a bad thing. The wombat looks cute but he can have very bad moods. A wombat moves slowly and is quite capable of defending himself. When you are finished your animal pencil drawing, do a quick critique by holding it up to a mirror. Immediately you gain a different perspective and anything that is out of place becomes more apparent this way. It's all part of the process of teaching yourself to draw and these are your tools. It's good fun and I hope you try it out. Experimenting helps you find methods that suit you and it soon becomes routine. 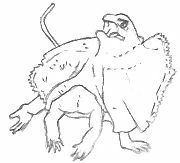 I hope you have found your favorite animal pencil drawings on this page. As you know, a snail moves very slowly. As beginner artists, we think we progress slowly but in reality we are making great headway with our artwork. If you decide to quickly copy these easy animal pencil drawings without any care, you are still benefiting by the practice. I think of it as painless practice because I enjoy seeing the results of my copy work. I know I have mentioned this once or twice but it is very important to keep practicing. These images are easy and fun to create. Show your friends, they'll be surprised by how much improvement you have made. This spikey fellow is an echidna. They are also known as spiny anteaters because their main diet is ants or termites. I remember seeing a real one when I was at school but I wasn't brave enough to touch it. He's certainly an interesting looking creature with an unusual name. It was easy to draw, the spikes are suggested around the outside and the main body is left blank. It is a drawcard when you leave something to the viewer's imagination. 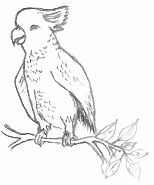 Here is a good, easy outline of a cockatoo. Every time I draw a bird, I feel peaceful and closer to nature. Keep your skills sharp by practicing with these animal pencil drawings. When the weather is perfect, I love to draw outside because the light is great and I welcome the peace. I created these animal pencil drawings from reference books while I was outside relaxing. I use a clean piece of paper under my hand to stop any marks or dirt from getting onto the paper. I have printed "hand" in big letters on the paper so I don't mistakenly draw on it in the future. I usually do several illustrations on the same page because it saves paper plus I kind of like having a mixture of things on one sheet. There is no time like the present, start drawing today, you won't regret it!